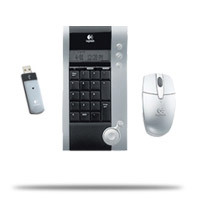 Smart Number Pad: Make quick calculations and automatically send data to your PC�s clipboard. Durable Travel Cases: Pack the mouse and the number pad separately and easily. Reliable Wireless: Eliminate cable clutter. LCD Display: View time, date and temperature anytime. On/Off Switch: Make your battery last all the longer. Go exactly where you want to go. Optical Engine: Enjoy smooth, precise accuracy. One-Touch Controls: Access your PC�s audio and video.